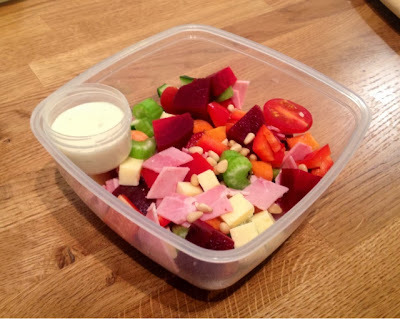 Now we’re well into January, my healthy eating kick is going strong and I’m trying to come up with varied and interesting packed lunches to keep me motivated. I’m getting a bit bored of lots of leafy stuff so I decided to change things up a bit and took a few tips from our friends across the pond. ‘Chopped’ salad is a bit of an American thing, all it really means is that all the ingredients are roughly chopped to the same size, the idea being that you can get a taste of everything in one bite. You could put some rocket or other leaves in this if you want, but I wanted a bit of a change. Raw veg works quite well in this, such as carrots and pepper, as they’re nutritious and can be chopped easily into nice bite size chunks. I’ve also added pine nuts for a bit of texture. 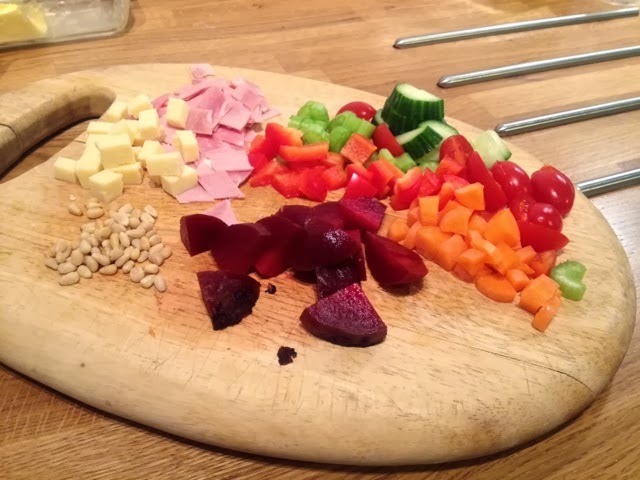 I think the key to making this kind of salad tempting to eat is colour, keep it bright, mix up your colours, there’s nothing more boring than a plate full of dull green. You could put all sorts of different ingredients in though, avocado would work well, boiled eggs if you like them (I’m not a fan but people seem to love them). Bacon and blue cheese would make a good alternative to the ham and cheddar I’ve used here, or go for feta for something more Mediterranean. I usually make my own dressings or mix up some sort of flavoured mayo (pesto mayo and mustard mayo are regular features in my lunchbox) but I picked up an American Style House Dressing in Morrisons the other day that I wanted to try and I thought it would go well with this sort of American themed lunch. Shop bought dressings aren’t the healthiest thing in the world but once in a while won’t hurt and use them sparingly.